The Detroit Lions, under first-year Head Coach Buddy Parker, had won the first two games of the 1951 NFL season before slumping to 0-2-1. Bouncing back to win at Green Bay, they faced the Chicago Bears, a team they had lost to two weeks earlier at home, on November 11 with a 3-2-1 record in an important National Conference showdown. Fourth-year QB Bobby Layne (pictured at right), originally drafted by the Bears out of Texas before moving on to Detroit by way of the New York Bulldogs, directed an offense that included halfbacks Bob Hoernschemeyer and Doak Walker and big (6’5”, 265) end Leon Hart. With a tough defense, the Lions had the look of a team on the rise. Chicago was leading the conference at 5-1. Guided by owner and head coach George Halas, the Bears utilized a solid running game behind an outstanding line while sore-shouldered Johnny Lujack and Steve Romanik split time at quarterback. There was a crowd of 46,210 in attendance at Wrigley Field. On the opening series, Layne threw twice to end Dorne Dibble, first for a 47-yard gain and then for a 26-yard touchdown just two minutes into the contest. Chicago battled back with Steve Romanik completing a 54-yard touchdown pass to end John Hoffman early in the second quarter. Doak Walker returned the ensuing kickoff 51 yards to set up his 10-yard field goal that gave the Lions a three-point lead. A fumble by Romanik was recovered by DE Ed Berrang for the Lions at the Detroit 27. Layne connected on three passes to Leon Hart of 11, 25, and a TD-scoring 17 yards. Berrang, who had a big day defensively, intercepted a deflected pass by Romanik shortly thereafter and returned it to the Chicago nine. From there, Layne threw to Hart (pictured below) for a nine-yard TD. The Lions went into halftime with a 24-7 lead. The Bears proved to be mistake-prone and repeatedly hurt themselves. Meanwhile, Layne had outstanding pass protection which proved especially significant during Detroit’s 17-point second quarter. Chicago FB Fred “Curley” Morrison returned the second half kickoff 86 yards to the Detroit 10. Johnny Lujack tossed a touchdown pass from there to end Gene Schroeder in a bid to get the Bears back into the game. However, another drive by the Bears into scoring territory came up empty when rookie safety Jack Christiansen intercepted a Lujack pass in the end zone. The Lions then proceeded to go 80 yards to score again on a three-yard run by FB Pat Harder. Down 31-14 in the fourth quarter, Chicago scored as Lujack threw to end Jim Keane for a seven-yard touchdown. But once more the Lions responded in kind, with Harder catching a pass from Layne for a 15-yard TD and then adding a 43-yard field goal. 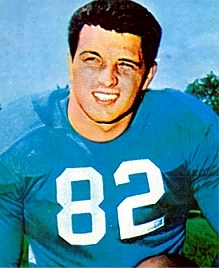 HB George Gulyanics ran four yards for a touchdown for the Bears, but the outcome had long been decided. Detroit won by a convincing score of 41-28. The Lions led in total yards (436 to 377) and first downs (24 to 21). They also benefited from six Chicago turnovers while turning the ball over just twice themselves. Bobby Layne had a big day as he completed 16 of 30 passes for 259 yards and four touchdowns. 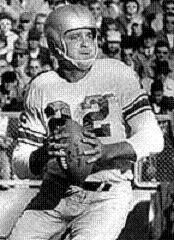 Johnny Lujack was successful on 14 of 20 throws for 187 yards for the Bears. The defeat of the Bears put them in a tie with the Rams at 5-2 atop the National Conference while Detroit pulled to within a half-game of first with a 4-2-1 record. The battle for the conference title went down to the last week, with San Francisco also in the mix. In the end, it was the Rams on top at 8-4 and Detroit and the 49ers tied for second with 7-4-1 records. Chicago, upset by their cross-town rivals, the Cardinals, in the season finale, ended up fourth at 7-5. Bobby Layne ranked first in the NFL in pass attempts (332), completions (152), yards (2403), and touchdown passes (26) – although he also ranked first with 23 interceptions, tied with Adrian Burk of the Eagles. He was named to the Pro Bowl for the first of five times in his Hall of Fame career. Leon Hart caught 35 passes for 544 yards and 12 touchdowns, receiving consensus first-team All-Pro honors as well as Pro Bowl recognition. Rookie Dorne Dibble ranked second in yards per catch (20.4) on 30 receptions for 613 yards, six of which went for TDs.